The patachitras of Orissa are icon paintings that include the wall paintings, manuscript painting, palm-leaf etching, and painting on cloth, both cotton and silk. Chitrakar painters in and around Puri practice this living art form. The village of Raghurajpur is where many chitrakars live in an area dedicated to them called Chitrakar Sahe. This art of painting on cloth can be traced back to the establishment of the shrine of Lord Jagannath at Puri in Orissa. 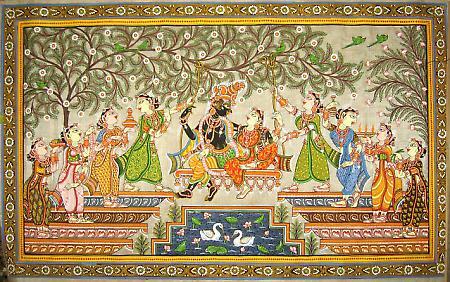 The patachitra when painted on cloth follows a traditional process of preparation of the canvas. First the base is prepared by coating the cloth with the soft, white, stone powder of chalk and a glue made from tamarind seeds. This gives the cloth tensile strength and a smooth, semi-absorbent surface, allowing it to accept the paint. The artist does not use a pencil or charcoal for the preliminary drawings. It is a tradition to complete the borders of the painting first. The painter then starts making a rough sketch directly with the brush using light red and yellow. The main flat colours are applied next";" the colours used are normally white, red, yellow, and black. The painter then finishes the painting with fine stokes of black brush lines, giving the effect of pen work. When the painting is completed it is held over a charcoal fire and lacquer is applied to the surface. This makes the painting water resistant and durable, besides giving it a shining finish. Patachitra paintings were traditionally drawn by the mahapatras or maharanas, the original artiste caste in Orissa. These paintings became an important art form with the ornamentation of Lord Jagannath in the innermost sanctum, where paintings on especially treated cloth or pata of the deities were done by the temple painter. The themes were tribal and folk.